About ten people gathered after a long time by the alumnus in the high school in friend's house and the broiled meat was done. It ate making it while teaching how to make because a delicious hand-made noodle was made at that time. The Sanuki-Udon noodle, and it introduces the how to make because it was very delicious. It often mixes it until putting the salt in water, and melting completely. Water and the salt are made rather few in case of rain. It to be easy mix it, flour is put in a large bowl or pan. Next, it makes it like "boroboro" to putting the half, and the mixture of salt water. It makes it like "boroboro" to putting the salt water of the remainder in. It hardens little by little and it brings it together like the dumpling. This is called a cloth. The cloth is sprinkled to flour, it puts in the plastic bag, it wraps with the bath towel, and it steps by the foot. The mass is expanded from the inside to the outside. A wide cloth is folded and it steps by the foot again. This is done for 20-30 minutes. It becomes soft of the earlobe title. Summer is left at 2-3 hour normal temperature in winter for one hour while put in the plastic bag after the cloth is rounded. It doesn't care even if stepping by the foot again here. It might be also good to find how to make my style confirming the result making it several times. 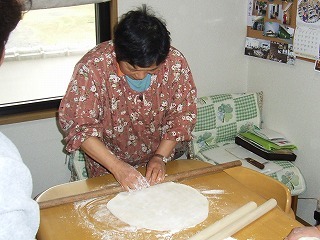 The cloth is rolled on the table and the kotatsu board with a rolling pin and it extends it. The sword powder is done so that the cloth should not stick when expanding it. When the thickness of the cloth becomes about 3mm, the cloth is folded to the width of about 3mm with the kitchen knife like the folding screen completely. The kitchen knife keeps vertical, is pushed, and cut. The noodle is untied so that the noodle should not stick after it cuts it and flour is sprinkled. Water is put in by about 5-10 times the amount of the noodle a big pan, it multiplies by the fire, and it is boiled. It is made not to stick until putting the noodle in this and boiling again and it mixes it with big chopsticks. Thermal power is adjusted so that the hot water should not boil over from the pan, and it boils it for 13-15 minutes. The noodle is cooled, and it puts in a cold stream by scooping it, the stickiness of the surface is dropped to the bamboo basket, and the noodle is cooled. When it eats the hot one soon, it makes it to the boiler deep-frying noodle. Eating within 30 minutes with the noodle soup and the tool is ideals. After the cornstarch or potato starch is sprinkled to the noodle, it incases when carrying without boiling at once and eating the cut noodle. The noodle doesn't stick when the cornstarch etc. are firmly sprinkled.